The wet cupping therapy was carried out by our expert therapists at Physiotherapy hospital. This Chinese hospital in Lahore is providing you first ever wet cupping therapy with best results. No side effect with proper and modern techniques. The wet cupping therapy is perform according to a modern method with modifications. To perform a wet cupping, sterile disposable cups measuring about 5 cm in a diameter are use. First the area for which they do cupping, selected for the procedure, clean with antiseptics. Disposable cups are gently and professionally place on the posteriors neck and thoracic spinal regions, negative pressure is apply using a wet cupping therapy vacuum pump. Then the cups will remove after about 5 to 10 minutes. For more information Call us� 03171172688 or� live chat with our experts…! After that vacuum pumping was applied for the second time, draining about 2 to 5cm per cube of blood per cupping site. This technique is covered with sterile pads. As a measure against a negative reactions such as fainting because of bloodletting or pain indolence, our emergency doctors or physicians and nurses with emergency kit are always ready in the application room to promptly respond to negative consequences that would occur during the procedure. You will not experience any adverse reaction during the procedure. The venous blood levels of some blood heavy metals after wet cupping therapy significantly lower than the levels before therapy. All the toxins and waste materials in blood clean. It promotes the blood flow and opens the all blockages in blood flow which causes disorder and diseases in your body. Wet cupping therapy can be used for many purposes and for certain diseases and disorder. 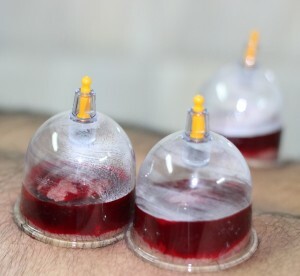 You can also get wet cupping therapy for the cleaning of blood and for blood clotting and blockage prescribed by our Chinese experts and professionals at Physiotherapy hospital.